QuickTime clip showing photos from the meeting and new Keynote2 transitions and features: small (312K), medium (1.45 MB), full size (29.45 MB). January’s meeting was a week late, delayed by Old Man Winter, but it was worth the wait! The usual format of Q&A (question and answer) began the event and it built from there. Pat Fauquet, our Pi Monthly CD expert, gave a quick tutorial on the ins and outs of the monthly CD. Then the attendees were treated to the main event, a presentation by local Apple representatives on the latest and greatest from Apple. The presentations were professionally done via the new Keynote 2 application (part of iWork), and some actual hardware was available for inspection. An iPod shuffle (note the capitalization) was held up for all to see, while a Mac mini (again, note the capitalization) was passed through the audience under the watchful eye of the Apple representatives as more than one of us would have loved to take it home and add it to our Mac collections! Finally, after a great “show and tell” session, during which I had to wipe the drool from my mouth a couple of times, we ended with a short business session and then the door prize give-aways and raffle. The Raffler application, our Programming SIG’s own creation, performed flawlessly, and we gave away several bookstore-quality books provided by O’Reilly. The meeting had a modest crowd and many were still buzzing in conversation when I departed. Several members continued their conversations at a nearby restaurant where they customarily meet for lunch after the meeting. A nice event this month. Several good questions were asked of Lawrence, our Mac expert extraordinaire, and a common response was to use the Mac OS X Disk Utility to Repair Permissions. This procedure is easily done by opening the Utilities folder and launching the Disk Utility application. Select the target hard drive and then simply select the Repair Permissions button. It may take some time, but when it is done, all folders and files will have their permissions properly configured. If you’ve had a crash or other major problem, a better method, as pointed out by Lawrence, was to start your machine from your Mac OS X install disc. Begin by canceling out the install process and open the Disk Utility application from the File menu. Within Disk Utility, select Disk First Aid and ask it to Verify Disk. If it finds any problems at all, select Repair Disk, then Verify again. These steps help ensure that the hard drive’s catalog is in good shape and keeps proper track of everything. Pat took a few minutes to point out the best of the latest monthly Pi Fillings CD-ROM. She demonstrated for the audience just what was on the CD-ROM and where to find it. From QuickTime Movie interviews, to software updates, to Mac publication articles, it has it all. Amazing all the goodies one can get on that little disc! Our guest speaker, Brian, hails from the regional Apple office located in Reston, Virginia. Two colleagues, Themis Tzamarias (also from the Reston office) and John McDonnell (from the Apple Store in Tysons Corner), joined him to talk, and demonstrate, the new offerings from Cupertino. Of course, the big items were the iPod shuffle and Mac mini. 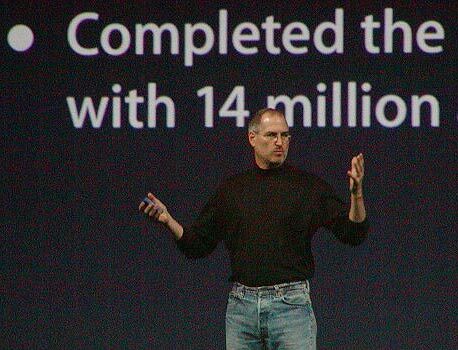 Brian reported there were no iPod shuffles available from local Apple Store; every shipment sold out within an hour or two of arrival. And as for the favorite iPod accessory, a new model Mercedes will have the ability to incorporate your iPod directly into the car’s speaker system. Best accessory to date! 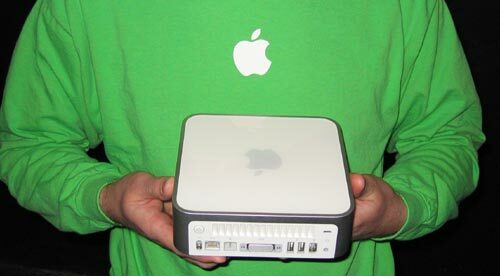 As for the Mac mini, it is the smallest and most affordable Macintosh ever offered. Feedback over the years resulted in this Mac. Brian gave us a nice presentation on the features of this new Mac. Notable highlights were options for adding Airport Extreme & Bluetooth wireless networking, a wireless keyboard and mouse, and a SuperDrive too. One possible drawback was the single DIMM slot. The Mac mini comes with the latest version of Mac OS X plus iLife ‘05. Can I put it on its side? Brian stated that this could be done, but stacking them was not recommended, because cooling airflow enters from the bottom of the computer. Will my 10-year-old VGA monitor work? It should. Just use the included DVI to VGA adapter and hook it up. If you travel with it, will the power adapter work in other countries? It has a standard universal power supply, 85 watts and 110-220 volts. AppleCare for the Mac Mini is $149. Can you run it headless? Yes. Does it have a speaker and microphone? Speaker yes, microphone no. Themis Tzamarias took over and talked about the iPod shuffle. He stated it sounds as good as the original iPods. Apple interviewed many iPod users and found there is a wide use of the Shuffle mode, and thus this new version of iPod was developed and named with that in mind. There are actually two modes, Shuffle and Sequential play, if you don’t like being surprised at what your iPod picks for you. The iPod shuffle has a rechargeable battery and it takes in the neighborhood of twenty to thirty minutes to recharge using a computer’s USB port. This iPod plays for an extended length of time; Themis can personally verify up to 15 hours. The one-gigabyte model will hold 250 songs based on an average of four minutes each. No worry about skipping either because the music is contained on a memory chip. He did have one with him and held it up for all to see. He demonstrated the use of the lanyard and how it firmly clicked into place over the USB connector. It will not easily slip off and drop the device, as some folks were concerned about. Themis then presented the first part of the software portion of the program, starting with iWork and its two applications (so far), Keynote 2 and Pages. The entire presentation was done using the new Keynote 2 application and it is impressive. There are many new effects and it ties into all of Apple’s iApps. Keynote 2 has the new Mac OS X Tiger core video already integrated into it. Cinema quality transitions abound with movie quality -- very impressive! [You can see brief examples of what Keynote 2 can do on the Pi Web site by looking at some QuickTime clips created with Keynote. The other half of iWorks is Pages, “the word processor with an incredible sense of style.” Themis explained that Apple’s venerable AppleWorks didn’t leverage the power of Mac OS X and so Pages was developed to start the process of replacing AppleWorks. The templates provided by Pages are also impressive and the real time wrapping of text around images was astounding. As a demonstration, a photo image was moved about in a page of text and the text continually shifted to wrap the graphic instantly. This application is totally compatible with AppleWorks, Word, Safari and PDF. It also is totally integrated with all the iLife ‘05 applications. Finally, John McDonnell from the Tyson Apple Store gave us the latest on the new versions of iPhoto and iMovie. Besides appearing to be more responsive, there are some new features to iPhoto 5: the addition of a calendar helps you find photos based on the dates the pictures were taken. Also improved: when you import photos you will have the ability to add descriptive titles, then using Keyword searches you will be better able to find that certain photo you are looking for. Another iPhoto 5 feature is an additional Edit function titled Adjust, which you can find by double clicking the photo and then selecting the Adjust button. This feature goes beyond the ones offered in previous versions by giving you some Photoshop-like adjustments. They range from a Straighten option to the more sophisticated Levels feature. You will be able to further control the photo’s aspects with control over Saturation, Temperature and Tint. There is even a Sharpening function to help make your photo more detailed. Photoshop Elements, look out, there’s a new kid in town!! Regarding final photo products, iPhoto’s Book feature offers more themes, more sizes, and two-sided printing with hard or soft covers. Even the book page limit has been doubled to 100 pages.... we’re talking serious photo albums now! Of course, the more photos you have the longer it is going to take a large library to load. Be patient, the wait is worth it. The iLife ‘05 version of iMovie, iMovie HD (High Density), has been nicely enhanced too. There are more options for importing now, including support for the iSight camera. Total integration with the other iLife apps coupled with new, cool transitions and MagicMovie, a feature that builds the movie for you, make this version of iMovie another winner. The iDVD application in the iLife ‘05 package has also been refined. Rolling drop zones is a real impressive addition. There are even more themes and the time limit is now 2 hours; that’s enough time for the whole audience to take a good nap and still be able to catch the grand finale! The Pi Board of Directors (BoD), in its last business meeting on Jan 26th, approved an amendment to the By-Laws which, if approved by the membership, seeks to change the day the nominations for BoD positions are due. As explained by John, with the success of our electronic voting during last year’s election, the BoD felt the Pi could accept nominations closer to the election date in May. Therefore, the amendment, which by hand count was unanimous minus one opposing vote, approved moving the nomination deadline to midnight on the day of the March General Meeting. Everyone has a little more time to come up with a nomination for the five positions that will be vacant this year. And if you are not aware, you can even nominate yourself! Come join the Board and make a difference in the PI. Closing session - the freebies! With the recent Macworld and several of our members attending, there were many free handout items brought back to share with the membership. As nice as some of them were, everyone hung around for the biggies. This month’s meeting had five grand prizes, each a full edition of a new book just published by O’Reilly Press. The titles were far ranging – iLife ’04: The Missing Manual; Mac Annoyances; iPod and iTunes Hacks; GarageBand: The Missing Manual; Mac OS X Power Hound; PowerBook Fan Book -- and the winners were: Beth Laakso, Ross Hatch, Skip Dye, John Barnes and Robert Gault.